As Simsimi ranked high at the American app store, more people gets interested in Simsimi. Among the issues on Simsimi, there is an comparison between Simsimi and Siri(of iPhone 4S). Simsimi and Siri is basically same in the point that both are chatting robot considered to be having persona. Still, there are a couple of differences between them, let’s focus on the point closely. The most important element makes differences between Simsimi and Siri is voice interface. 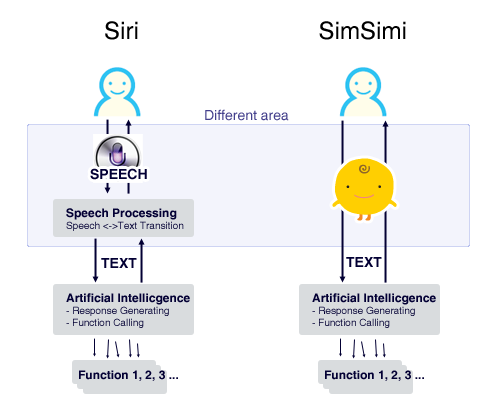 If Siri does the performance only by inserting and printing text data without its characteristic of voice recognition and voice synthesis, it will be recognized same as Simsimi, Simsimi will be recognized Siri if it has additional two characteristics. There will be an argument that Siri is distinguished from Simsimi in the point that it has Agent functions such as reminding schedule, getting direction, forecasting weather, and booking airplane. However, Simsimi had performed similar task in Korea at the service for feature phones around 2004. Agent service such as weather service, dictionary service, searching mobile contents service and a match making services were developed and implemented to the Simsimi service, if IT infrastructure had been supportive as now, Simsimi could be leading service scenario offering information impressively on screen through its mesh-up service. All you have to do for programming agent function is only giving instruction on which function to be performed out of various functions which are prepared in advance, when artificial intelligence module is analyzing the user input. From this point, Simsimi and Siri’s agent function is basically same. Lastly, as it is mentioned in several media, how they learned the words they use in a conversation. It shows the differences of two services clearly. All of the responses from Siri are arranged by iPhone4s’s developer, Apple. Answers made from inside of company are elaborately consisted for various situations. Likewise, interesting reactions of Siri which is in the limelight are Easter eggs strategically intended for promotion. As you see, unlike Siri whose jokes are calculated by the company, all response from Simsimi is from its users. Simsimi has user-friendly interface, so that user can teach words to Simsimi and the words Simsimi learned is used when it has a conversation with other users. It is explained as if everyone inputs their own opinions on certain theme to Simsimi, it delivers what others think to people who talk on the same topic. Because nothing is arranged in advance, it gives diversity of answers that gives us more entertainment than sum of millions of Siri’s Easter eggs jokes.